A few common questions and answers about aluminum Christmas trees. Q: I can't find the trees for sale! Where are they, and how much do they cost? A: There is a navigation bar on every page at the top. Click on the link that says "STORE" and choose the Aluminum Christmas Tree category you'd like to see. All trees seen on the site are sold via eBay sellers. We no longer sell trees directly. Q: The photos of some silver trees look like they are slightly gold in color. Are these trees discolored in some way? A: No, that's just an artifact of lighting. Sometimes silver trees show up that way. Q: I have a tree/color wheel/turner stand that I'd like to sell. Are you interested in buying it? A: Probably not. We have good sources that supply us with all the trees and color wheels we can use. Q: I recently found an old aluminum tree, but it is missing the trunk. Can I buy a new trunk from you? A: Sorry, but each manufacturer used unique trunk designs for each of their tree models. There is no such thing as a generic replacement trunk. If you need a trunk for a six foot, 94 branch Evergleam tree, only a trunk from an identical tree will work to replace it. We have no replacement trunks. In short, if your tree is missing the pole, you will need to buy another tree. Q: The motor on my color wheel quit working. Do you sell replacements? A: While the motors for most color wheels are similar to one another, they all had different ways of mounting to the wheel's frame. As each model was unique, there is no way to offer a generic replacement motor. Sorry. Q: I have an old aluminum tree and color wheel. Can you tell me how much it is worth? A: Prices vary widely from region to region and from year to year. There is no set "value" for a given tree. As such, we cannot appraise your tree. They're pretty. Just enjoy them. Q: I'd like to contact you. A: Check the menu at the top of the page for our contact link. Q: I am a retailer, and I would like to buy a number of trees from you. Do you sell wholesale? A: Sorry, but we no longer sell trees directly. Q: Some descriptions say that the trees have tape on the branches. What does this mean? 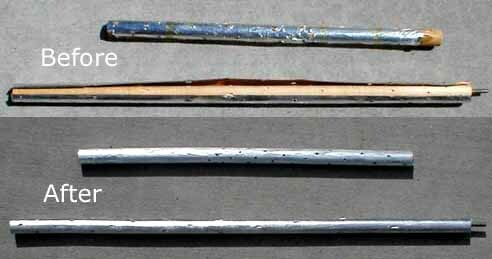 A: The branches were originally assembled by wrapping a length of foil around a length of steel rod. That foil was glued at each end. Over the years, the glue tends to age and weaken, and usually the foil breaks loose at the end of the branch that goes into the trunk. "Tape on branches" means that the foil has been re-secured with cellophane tape. This is usually not visible when the tree is assembled. See the photo below for clarification. 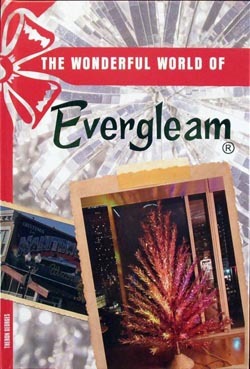 Q: A lot of Evergleam trees seem to problems with the trunks. Why?